Zinfandel! Call it Zin for short, or Primitivo, Tribidrag, Crljenak Kaštelanski, Plavac Mali … This remarkable grape found its way from Croatia to Italy and America (and, nowadays, on to Australia and beyond). It comes in a variety of styles, although “big fruit with big alcohol” may be most common. The wine in your glass should be an adventure. Each month The California Wine Club travels the dusty back roads of wine country seeking out small California wineries passionate about the art of winemaking. 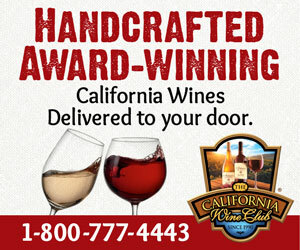 The California Wine Club hand-selects the very best of the award-winning wines they discover and then shares them with their members. Give them a try! Get $95 in Gifts. Join Now. Whether you love Zin for its march to the beat of a different drummer, or approach it with skepticism because it’s so at odds with classic European styles, we hope you’ll take a moment this month to open a bottle or two, share your thoughts in our WineLovers Forum’s “Wine Focus,” and – especially – alert us to the exceptional bottles and the great values. Long considered a “mystery grape” because its ancestry was lost, perhaps clouded by the 19th century Barnum-style hype troweled on by Agoston Haraszthy, Zin his recently been reunited with its ancestors thanks to dogged research and DNA detective work in recent years by Dr. Carole Meredith and others. Want to read more? Here’s a good article in English from a Croatian wine site that sums up in fairly simple terms the search to pin down Zin’s historic ancestry. What’s your take on Zin? Once you’ve opened a Zin or two, you’re invited to click over to Wine Focus and read and participate in the conversation. You can read the forum without registering, but if you’d like to participate in our conversations, you can quickly and easily log in via Facebook, using the “Social Login” button at the upper right corner of any forum page. Each month The California Wine Club travels the dusty back roads of wine country seeking out small California wineries passionate about the art of winemaking. These artisan wineries handcraft wines in such limited amounts that their wines rarely make it out of their winery doors. The California Wine Club hand-selects the very best of the award-winning wines they discover and then shares them with their members. A different small winery is featured every month, making this a true wine adventure. • Savor. Sample wines before you stock up. • Save. Enjoy $1 shipping on every case and half case + save up to 50% off every bottle. • Learn. Get tasting notes, winery stories, wine country information and wine tips in every shipment. • Visit. Get VIP tastings and tours at the wineries they feature. • Access. You’ll know about sales and special offers first. Get $95 in Gifts. Join Now. FOOD MATCH: Zin’s natural companion is red meat, simply prepared; it’s a classic match for an excellent, juicy burger (served safely medium-rare, we hope, from locally grass-fed and pastured beef). We served it one evening with stuffed green peppers, then checked its versatility, enjoying the rest of the bottle the following day with an African peanut stew with okra, eggplant and tomatoes. WHEN TO DRINK: It’s drinking very nicely now and not likely to evolve significantly with cellar time; that said, though, it will certainly keep and remain pleasurable for several years under cool storage conditions. VALUE: An excellent value at this mid-teens price, which matches Wine-Searcher.com’s $14 U.S. retail median for Bonterra Zinfandel. WEB LINKS Here’s Bonterra’s fact sheet for the 2011 Zinfandel; the website apparently has not been updated for the new vintage, but I wouldn’t expect major vintage differences. 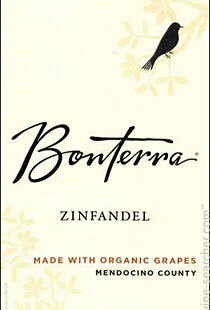 Compare prices and find sources for Bonterra Mendocino Zinfandel on Wine-Searcher.com.